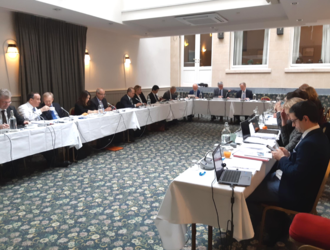 28 March 2019 – The Executive Committee of the European Association of Co-operative Banks (EACB) has met today for its 36th meeting. About 30 co-operative banks leaders have gathered in Brussels. Work have focussed on the banking regulatory framework at EU and international level, affecting co-operative banks such as retail and financial markets activities and the EU sustainable finance initiatives. On the “Banking package”, the Executive Committee took stock that on 26th February 2019 the ECON Committee approved the text already licensed by the Council Coreper. The legal acts will now undergo vote at the European Parliament plenary session before end of April and in May the Ecofin will rubberstamp and finalize the procedure. The members of the EACB appreciate that attention has been given to many specificities (e.g. leverage ratio, liquidity systems of cooperative banks, resolution of cooperative groups etc.) and to concrete proportionality measures for the reduction of compliance burden (particularly for reporting and disclosure, but also in the trading book and the NSFR) and to SMEs financing. On "Sustainable Finance", co-operative banks have been proactive in ensuring co-operative banks’ voice is heard in the debate with responses ranging from discussing approaches and creating a European ‘green’ taxonomy, to disclosing information on sustainability risk and investment, and to accommodating the prudential framework regarding sustainability. For this reason, the EACB Executive committee announced the organisation of an “EACB workshop on Sustainable Finance” that will be held on the 24th of May in Paris, kindly hosted by the Fédération Nationale du Crédit Agricole. This event will be an occasion to tackle the momentum and exchange, at a crucial point in time, with speakers from the EBA, ESMA, NGSF, EU Commission and other players. Finally, in the context of the forthcoming EU elections, the EACB reaffirmed its full support and commitment to the European project, in line with the co-operative banks’ values of democracy, solidarity and diversity and their role in the European economy. Co-operative banks support actions from policy makers to ensure inclusive and sustainable growth; to reduce unemployment in Europe and to take the lead to address climate change. The European Association of Co-operative Banks (EACB) is the voice of the co-operative banks in Europe. It represents, promotes and defends the common interests of its 28 member institutions and of co-operative banks in general. Co-operative banks form decentralised networks which are subject to banking as well as co-operative legislation. Democracy, transparency and proximity are the three key characteristics of the co-operative banks’ business model. With 3,000 locally operating banks and 58,000 outlets co-operative banks are widely represented throughout the enlarged European Union, playing a major role in the financial and economic system. They have a long tradition in serving 209 million customers, mainly consumers, retailers and communities. The co-operative banks in Europe represent 81 million members and 742,000 employees and have a total average market share of about 20%.